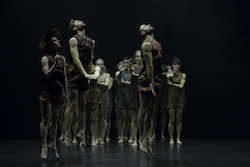 Sydney Dance Company Artistic Director Rafael Bonachela has once again used his collaborative skills to create a winning combination with two contrasting works to engage and excite a full house at the Roslyn Packer Theatre. 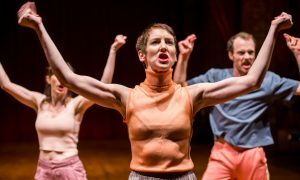 Having caused a stir with Wildebeest’s premiere as part of the 2014 New Breed program, Gabrielle Nankivell has shown herself to be a choreographer of note with distinctive quirkiness and depth. Wildebeest is both disturbing and exciting. Gabrielle Nankivell’s ‘Wildebeest’. Photo by Pedro Greig. A storm ignites; we rest transfixed as Bernhard Knauer embodies the passage of a new born foal attempting to find its feet in a new world. And as the work unfolds, there is a debut, an ensuing development which leads us into the unrelenting evolution of humanity, progress and modernisation. 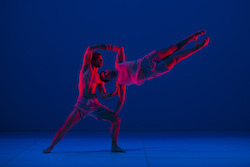 With a brilliant display of technical precision, the Sydney Dance Company literally shifts gears to replicate the inner workings of a machine — sounds of a clock, intricate twining, intertwining of arms, hands, heads. We find ourselves in an urban and mechanised world, exacerbated by the stark and sometimes brutal industrial soundtrack created by Smiles. As if surprisingly and almost too soon, the mechanised beast has finished its shift, and darkness falls. Part II brings a complete change of focus — moving from this brooding and grounded, clinking and clanking mechanisation to the lightness of Bonchela’s Anima. Having been enraptured by two pieces of music by Dobrinka Tabakova, string trio Insight and Concerto for Cello and Strings, Bonachela was swept away on a creative process which would become Anima. 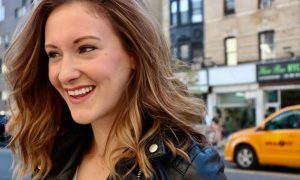 “As soon as I heard this, music I could see dance,” he said. Breath, vital force, taking off, optimism, flying and fierce determination are the recurring motives which underpin the work and take us on a whirling, swirling frenzied journey. It feels like the dancers have been swept into the eye of a cyclone with no choice but to use the force and counterforce of their relational contacts to take flight. Anima is also the beneficiary of Bonachela’s collaboration with Clemens Habicht, an Australian director, visual designer and illustrator who supports Anima’s dance using the tools of a filmmaker. Rafael Bonachela’s ‘Anima’. Photo by Pedro Greig. A long duet takes precedence in Anima, performed by Cass Mortimer Eipper and Petros Treklis to Tabakova’a emotionally charged cello and strings. The dancers don’t quite reach the same heights or go to the same depths as Tabakova’s music and seemed unable to “enter” the music, which might have transported the audience above and beyond the impressive technique. 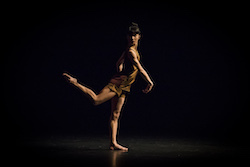 Aesthetically, Anima is a work constantly in motion, swooping and turning, force and contra force with standout performances by Charmene Yap with partner Knauer, as well as Latisha Sparks in the mechanical solo. This program really is a tour de force as the dancers rise to the challenge of both manifesting Bonachela’s visions ignited by the music of Tabakova, as well as realising Nankivell’s grounded and evolving Wildebeest. Photo (top): Rafael Bonachela’s ‘Anima’. Photo by Pedro Greig.